Many things in education have changed in the country over the past twenty years – many more children go to school, have easier access to information, spend more hours a day studying, get more marks in school, and study science and become engineers. A few things have however remained the same, especially for low and middle-income families – parents’ pressure on children to do well in exams, the rote method of schooling, and the limited access to hands-on learning (especially for science). Thus, while the fast changing world of technology has opened up opportunities and brought jobs to so many, there are many more who despite years of hard work to get “qualified” as engineers are found to be “unemployable”. We believe the key reason for that is that science in most schools in India is taught through text-books, with hardly any experimentation or hands-on activities. 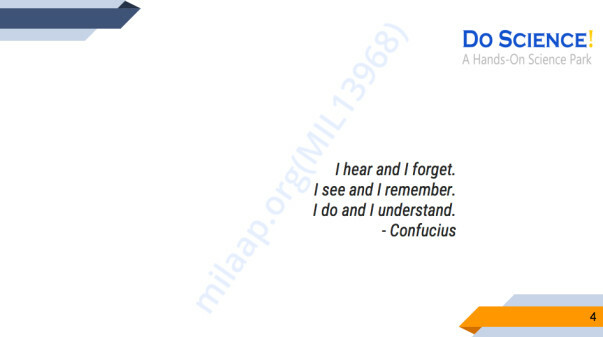 With our obsession with marks and grades, and the far from creative examination system, it is no wonder that most children acquire qualifications, but not a conceptual understanding. Sadly, while the elite and the privileged have access to better infrastructure and teachers, the problem is most stark in the low and middle income segments. Most of us have had those “aha” moments, when the science that we learnt in class made sense when we saw its application in real life. The moment we understood why Helium makes a balloon fly, how the cycle pedal moves the wheel, and why sound echoed against mountains. We believe that these moments of discovery do not have to entirely by chance, we can trigger them in free learning spaces or informal science environments. 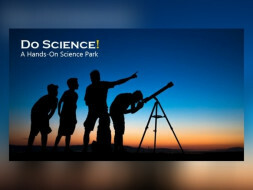 We at DoScience have come together with the objective of creating free learning spaces for children to play with science, to explore science and to discover science. We believe that by doing science without the rigid structures of classrooms and examinations, children will unearth the unlimited joys of exploring, questioning, analysing, and innovating. This will open their minds to curiosity and creativity, and help them graduate from “How?” to “What else can I do with this?” Such inquisitive minds will drive innovation and lead change. We plan to set up 5 DoScience! centres across Hyderabad over the next three years. 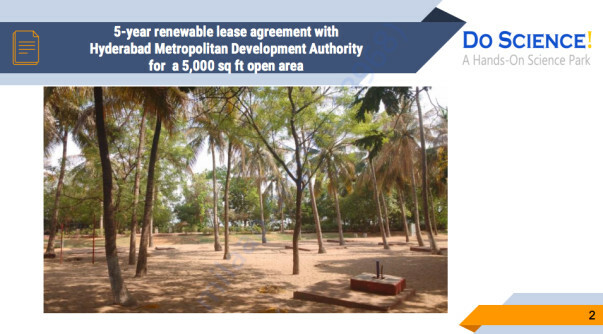 We have leased 5,000 sq ft area from the Hyderabad Metropolitan Development Authority, for our first DoScience! 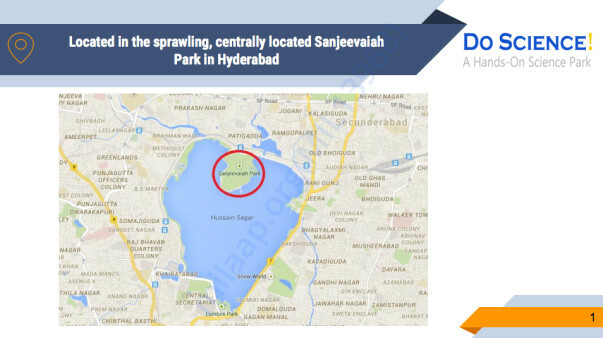 centre in the sprawling, centrally located Sanjeevaiah Park. 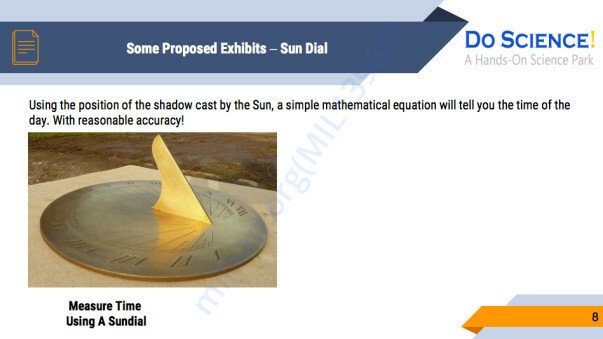 We have identified 30 robust exhibits, each of which demonstrates a fundamental principle of Physics. 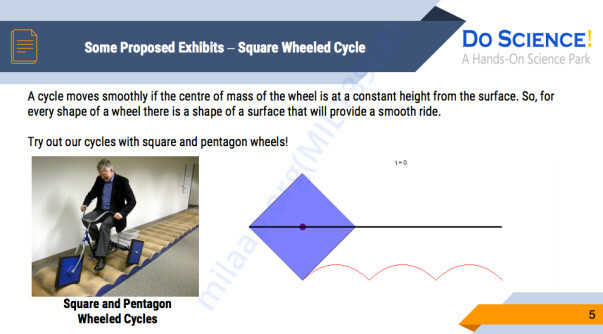 These exhibits are being custom developed by the Birla Science Centre. 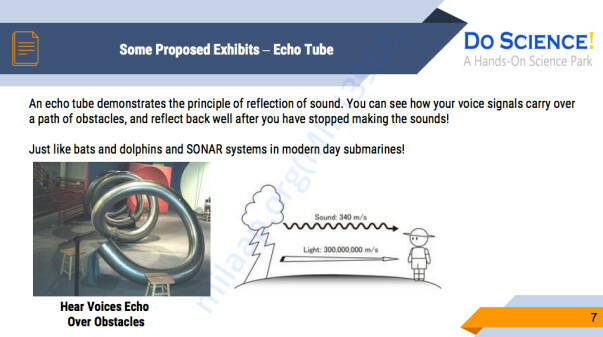 Some of the exhibits are included below. We are a team of experienced professionals who have built businesses and led large teams. We have roots in Hyderabad, and are passionate about making a positive contribution. You will find the profiles of some of our team at Aparna Vishwanatham, Akhil Vishwanatham and Malini Parmar. Our NGO, Bookmark Projects (Trust registration 135/IV/16), is set-up with the objective of creating a network of hands-on science centres in public spaces, easily accessible to the low and middle income communities. We have Income Tax exemptions under Section 12AA and 80G of the Act. So, all donations will get Income Tax exemption. We however can accept only rupee donations. The initial project cost for the first DoScience centre is Rs. 70 lakh, entirely towards the set-up of the project. All subsequent expenses will be fully met through ticket revenues (Rs. 50 per person for a day’s access to the centre). All government school students will be provided free entry to the Science centres at all times. 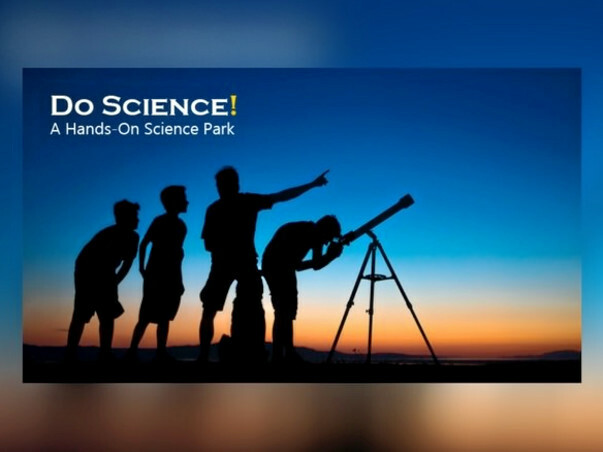 Over the 5 year period, we expect to provide an enriching science learning experience to over 3 lakh visitors, and will also be able to convince other cities and governments to set up hands-on science centres in their public spaces. Our exhibits are currently being fabricated at the Birla Science Centre in Hyderabad, with the funding made by the Trustees. We will start the first phase of the Centre by end-June 2017, and the complete Centre end-July 2017. Please join us in changing the landscape for science learning in India. Help us in creating a culture of science and innovation in the country. Contribute to support DoScience! 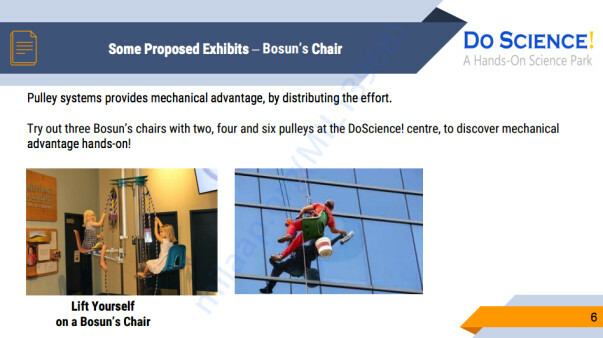 We look forward to showing you around the DoScience centre when you are here. In the meantime, you can reach us at aparna@doscience.co.in for any discussion. PS. Your 80G acknowledgement will come along with 5 entry tickets that you can use any time in the next five years. It has been a very interesting month and a half since we started operations at the DoScience centre at Sanjeevaiah Park. The city has been busy! Heavy rains over extended periods, intensive 10 days of Ganapathi puja and Nimarjanam, and now Dasara holidays. All these notwithstanding, we have done alright. Here is a quick update. In the gap between the Nimarjanam and Dasara vacations, the centre was well booked for school visits. And the weekend footfall from families has been healthy. Fingers crossed as we head towards winter – the perfect season for school field trips and family picnics. Feedback from schools and visitors has been consistently positive. There however has been some negative response to the larger Sanjeevaiah Park itself, which attracts – quite naturally for a park – young couples during the weekdays. We are working with HMDA to work through this issue. Our marketing efforts have so far included emailers, direct visits to schools and media features. We will be connecting with the government tourism and education departments in the coming weeks to further spread the word. Some entities have broached early conversations about expanding the centre and setting up another one. These are however early conversations and we are currently focused on ensuring sustainable operations at this centre. https://www.facebook.com/dosciencenow/ and share it in your networks. Dear all – it has been a hectic few months for us, with the project implementation moving at a good trot. 19 of the proposed exhibits have been fully installed in the centre. We are happy to share with you that the centre - DoScience @ Sanjeevaiah Park - will open to visitors on August 15, 2017. The Commissoner, HMDA will be inaugurating it. Here a small collage of the exhibits as they were being set-up and of the space. 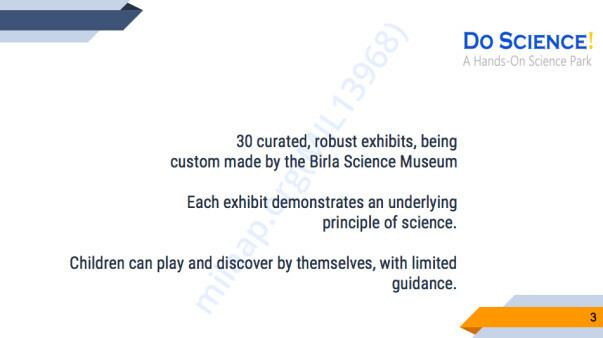 Our focus for this centre has been to improve the user experience of some of the existing designs of Birla Science and introduce some new ideas. In addition, we also worked extensively on the design of the space. Going forward, we will focus more on introducing new exhibit ideas, including for the next five exhibits in this centre. With the experience and the relationships built over the past few months, we are confident of trying out new exhibit ideas. And needless to add, the next few months will be focused on streamlining the operations and in building market awareness of our centre, particularly among schools. We will keep you posted on progress as we go forward. Those of you who are in Hyderabad or are passing through town this long weekend, we look forward to seeing you at the DoScience centre on August 15. Others, we look forward to seeing you soon! Here is a quick update. Our first batch of exhibits are in a final stage of fabrication and the space design is largely done. HMDA has, in the meantime, suggested that we launch the DoScience! centre at one go, instead of in phases as proposed earlier. So, we are gearing up for a full launch of operations towards end July / early August. Your 80G certificates and the donor passes will be sent to your email ids directly, in a few days. Thank you again for your support. We will keep you posted on progress. Plz do not send hard copy of donation to mailing address. Send via email.